Please donate "what you can" to help elect Montgomery County's first Asian American County Councilmember! We encourage you to "give what you can" online in advance to avoid long lines. As a public finance candidate, our campaign can only accept donations between $5-$150. 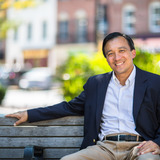 You may receive updates from Hoan Dang for County Council , the creator of this fundraiser.